Wow! The Green Dragon has really come into its own. Pub night was there Tuesday night for the "Meet the Brewer" session with Ninkasi's Jamie Floyd (more about Ninkasi lower down). It had been a few weeks since I'd been to the Dragon, and I'm really impressed at how it's shaping up. They even have pinball machines. From Day One, they had an impressive draft beer selection. Actually, it's hard to describe the draft selection, because the 20 taps are always changing, but the consistent thread running through the choices is that every tap is special -- very few of the beers they serve are on tap anywhere else in town. It's serious beer nerd territory here. Not a single tap is wasted on Hef or Black Butte or even Laurelwood Red -- all decent enough beers, but they're available everywhere. At the Green Dragon, the regional beers are often from breweries I hadn't heard of before (!) or, if I've heard of the brewery, the beer style is one that no one else pours. The imports are stylish choices like Dupont's Avec les bons Voeux, or Kulmbacher Schwarzbier, or the J.W. Lees Harvest Ale. I don't really like the J.W. Lees -- too sweet -- but my hat's off to them for serving it. Last spring the pub night gang was sitting outside of Roots when Lolo, one of the Green Dragon owners, wandered over and gave us some stickers. He told us about the pub they were planning in the old Yamhill Brewing space, including the plan to mostly serve rarities. We were excited to hear about a new place in the neighborhood. But after it opened, I didn't really warm up to the Dragon. The space seemed a little haphazard, and I was concerned that the pretty glasses they sold "pints" in were more in the 12 oz. range. There didn't ever seem to be too much of a crowd in there, and I was afraid the Green Dragon was just going to be a flash in the pan. I've been straightened out on all three of those quibbles, and now I can picture myself spending quite a bit of time there. The space feels better now, they have more tables than they did, they slapped some brighter paint on the walls, and -- most important of all -- there is a well-lit dartboard set up in a good place. As for the pints, Jeff at Beervana has pronounced the Green Dragon's glasses to hold 15 ounces, which, while not a pint, is close enough for me, given the quality selection and knowledgeable servers. Finally, the crowd that filled the place Tuesday convinced me that they're going to hang in there. Food's good, too. The spicy meatloaf sandwich with gravy and fries set me up pretty well. Eventually Lolo will be brewing his own beer onsite. Just one more thing to look forward to. It was nice to meet the Ninkasi brewer, Jamie Floyd, on Tuesday. 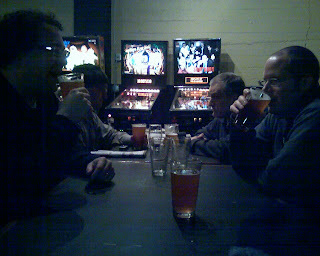 (He's not in this grainy photograph, that's the pub-nighter table from Tuesday.) As mentioned previously, Ninkasi sprang onto the scene last year with some excellent beers. Jamie says he's happy just being a brewery as opposed to having a pub attached, and it seems to be working out -- the beer is all over Portland now. The attraction Tuesday was Ninkasi's new Dunkelweizen, which was delicious. It's lighter in color than the typical German Dunkelweizen, but it has the classic yeasty/sour taste and esthery aroma. Higgins has it on tap right now also. Another nice surprise was Jamie's version of Spank Dog Pale Ale, a recipe from Eugene's Wild Duck Brewery, which must have gone out of business about the time I arrived in Oregon. The Spank Dog was malty and tasty with almost a fruity taste. It reminded me of something I've had, but I couldn't quite put a finger on it.